Having never been to this track before, Lewis was up against it as all his fellow competitors had an immense amount of experience at Oulton Park and it’s not the easiest to learn. Lewis did set some good time but finished 9th fastest in free practise. In the first qualifying laps Lewis improved on every single one and although he still had a long way to go to catch the front runners, he moved up to 8th position. Later in the second set of qualifying laps, Lewis continued to improve which saw him move up to 7th. Race 1: Yet again Lewis got off to a fantastic start, moving up from 8th to 5th place on the first lap but with a bad crash taking place behind Lewis the race was stopped. A complete restart was called with everybody returning to the qualifying grid positions, with the amount of time taken to clear up the crash and repair the track, the race distance was reduced to a sprint of 15 minutes. Lewis again had a great start and battled throughout the 15 minutes to finish in a very creditable 5th place, his overtaking manoeuvres are clean and he is gaining respect from his more experienced fellow competitors. Race 2: Again Lewis had a great start – the Hyundai seems to get off the line as good, if not better than all the other cars – which saw Lewis slot into 2nd place chasing the current BTCC Champion Ash Sutton and pulled out a gap on 3rd place Derek Palmer, half way through the race Palmer suffered brake failure leading to him crashing into the tyre wall. Lewis stayed in 2nd place for 99% of the race only to make a mistake on the last corner and finish 2/10 of a second down in 3rd place, a great race and still a great result with another podium finish. Considering Lewis had never seen Oulton Park before this weekend, he did a remarkable job which saw him move up to 4th in the Championship and get even closer to our target position of 3rd place. Two rounds now remain, both at tracks that Lewis has raced on before. With the improvements we are making to the car and the confidence Lewis has gained, we can expect more podiums to complete our year and hopefully achieve the 3rd place we targeted. 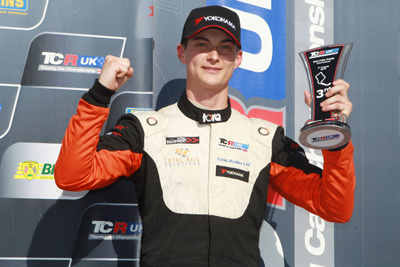 This entry was posted in Race Reports, TCR UK and tagged Essex & Kent Motorsport, Essex And Kent Motorsport, Lewis Kent, Oulton Park, TCR UK, TCR UK Touring Car. Bookmark the permalink.